Vast stores of fresh water exist deep beneath the seafloor—but who gets to decide how they’re used? In 2013, when scientists published the first global estimate of the vast reserves of fresh water locked away below the ocean floor, the resulting media hype made it seem like the global water crisis had suddenly been solved. The estimated amount of new water was staggering—more than 500 quadrillion liters of untapped fresh and brackish (slightly salty) water, just waiting to be piped into the world’s thirstiest regions. But as severe drought pressed on in places like São Paulo, Brazil, where kids had to skip brushing their teeth as a conservation measure, the enthusiasm waned. No one was making a go at the water. Chief among the reasons: no one was quite sure how to get it to the surface. Three years later, freshwater supplies around the globe continue to drop. This has some scientists taking a closer look at these subsea stores—for drinking, yes, but also as a tool for offshore oil extraction. Theoretically, pumping fresh water from below the seafloor to the street is possible. But a number of challenges stand in the way of understanding and, eventually, using this resource. Not the least of which is determining how the water originally got there. Brandon Dugan, a petrologist with the Colorado School of Mines, says that in some places the water began pooling more than 100,000 years ago, when meltwater from glaciers filled offshore water tables and was eventually sealed in by sediment as sea levels rose. In other places, the water arrived much more recently through rainfall and natural pipelines from land-based aquifers. 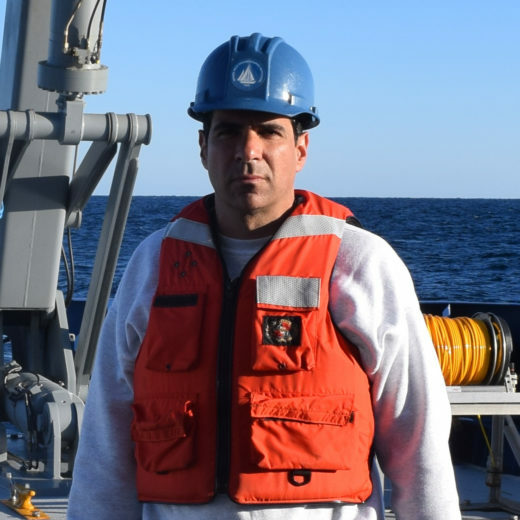 Mark Person, director of the New Mexico Tech Hydrology Program, says once a well is identified, the challenge would be to drill through the seabed in a way that keeps salty seawater out of the fresh water below. Person says aside from their obvious use as a new source of fresh drinking water, seabed aquifers could also be a boon to oil companies. Injecting low-salinity water into oil reservoirs has been shown to increase oil recovery by as much as 14 percent, and BP plans to use the technique at the Clair Ridge oil field in the North Sea. In that case, the seawater will be desalinated, but in the future, subsea reserves could be used instead. Statoil, an oil and gas company based in Norway, has looked at fresh water for oil extraction, but isn’t rushing to develop it. According to Ola Anders Skauby, a company representative, any techniques they leverage need to be proven and cost efficient. “The use of fresh water has been considered at Statoil, but currently there are no significant activities using fresh water due to uncertain improved recovery potential and costs,” Skauby says. If offshore fresh water becomes a viable resource, either for drinking or for improved oil recovery, legal disputes over rights to access and extraction will likely become an issue. So far, the situation has been relatively simple: each of the aquifers found to date is tied to a single nation. But Renee Martin-Nagle, an environmental lawyer and PhD researcher at the University of Strathclyde in Glasgow, Scotland, feels it’s only a matter of time before we see reserves straddling international boundaries. “International law for land-based water simply provides that use of the water must be reasonable and equitable and can’t harm a neighboring country’s resources. There is no one, clear governance regime that nations can refer to—but governance will be crucial for preventing hostile disputes over the resource in a water-scarce world,” she says. Person agrees the legal implications around transboundary aquifers are muddy at best, but feels we’re at least several years away from having to deal with it. Cite this Article: Evan Lubofsky “Tapping the Freshwater Ocean Under the Sea,” Hakai Magazine, Jan 11, 2017, accessed April 25th, 2019, https://www.hakaimagazine.com/news/tapping-freshwater-ocean-under-sea/. Ancient salt water is an important ingredient for making diamonds.